There is a lot of wedding projects and what not that I want to blog about! A lot of it will have to wait until after the wedding, some things need to be a surprise! 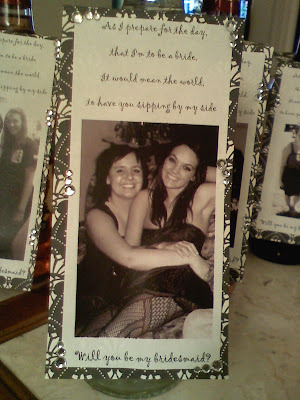 Today, I wanted to tell you how I asked my bridesmaids to be in my wedding! I bought 5 bottles of wine, I tried to pick ones that I knew they would like. to have you sipping by my side. I also put a little picture of us on it as well! I then cut a piece of scrapbook card stock and made a whole in the top. 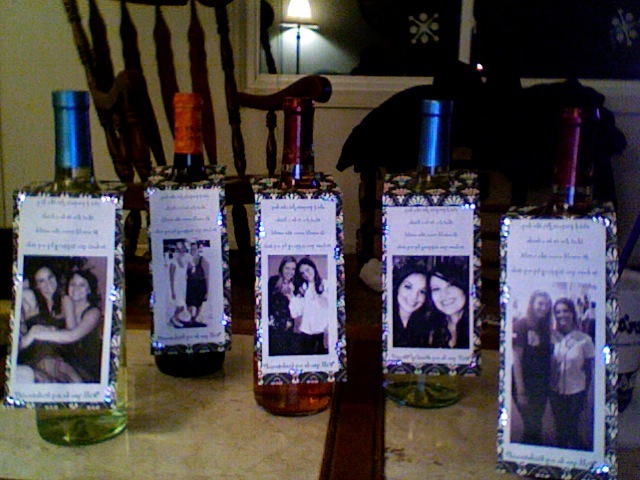 I glued the paper off of the word processor to the card stock and hung it on the wine bottle! M: You didn't have to get me wine. S: Check out the paper on it. M: This picture is so cute of us! If you wanna hear more about my bridesmaid check out my Meet The Maids post!